Two chefs, one kitchen, that is the idea behind Monthly-Mashup, a new dining concept happening at Talavera at Four Seasons Resort Scottsdale at Troon North. 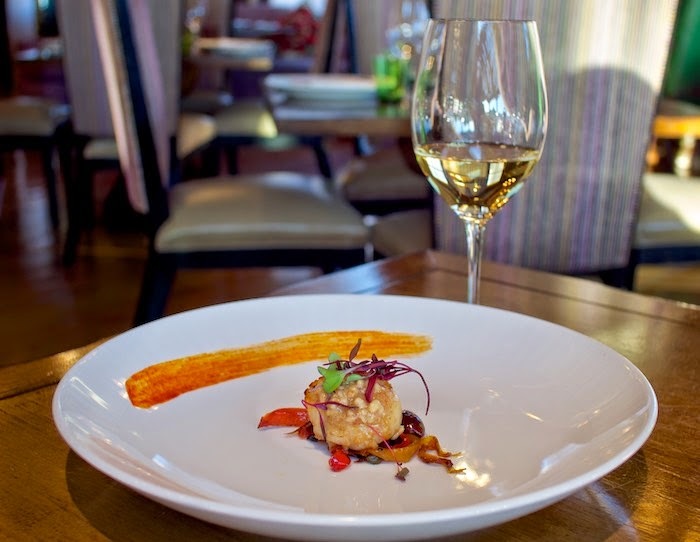 One night a month a local chef will step out of their kitchen – and into the kitchen of Executive Chef Mel Mecinas to join forces for an unpredictable night of culinary fun. On Sunday, April 19, Talavera welcomed Executive Chef Gio Osso and his award-winning restaurant Virtù Honest Craft and I was there! The dinner featured a four-course tasting menu, with highlights from each chef’s culinary background, and a chance to talk with the chefs about each course. 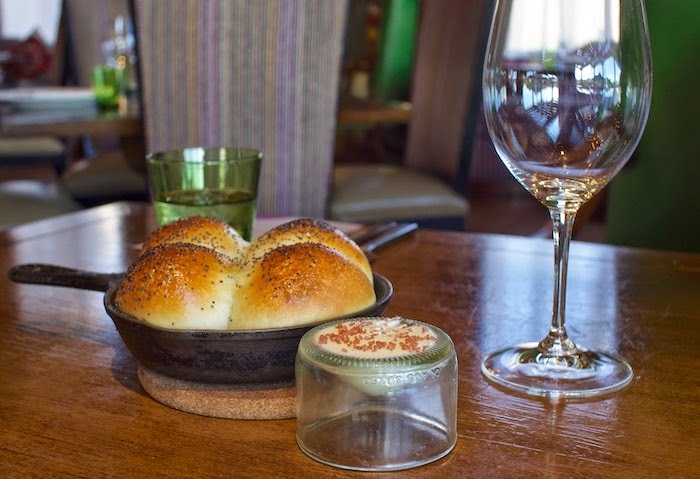 Our meal started as it typically does at Talavera with Chef Mel's buttery poppy seed buns and pink salted butter. Even though I knew there would be a lot of food coming our way I could not resist these hot out of the oven soft rolls. The amuse course consisted of Chef Mel's innovative ravioli formed out of ahi tuna and stuffed with dungeons crab and Chef Gio's truffled carne cruda with fresh porcini & quail egg shooter. The wine that was poured for this course was the Eugene Carrel Rose and it went wonderfully with both amuse. I would highly recommend doing the wine pairing with these dinners as Sommelier Shaun Adams is wonderful. 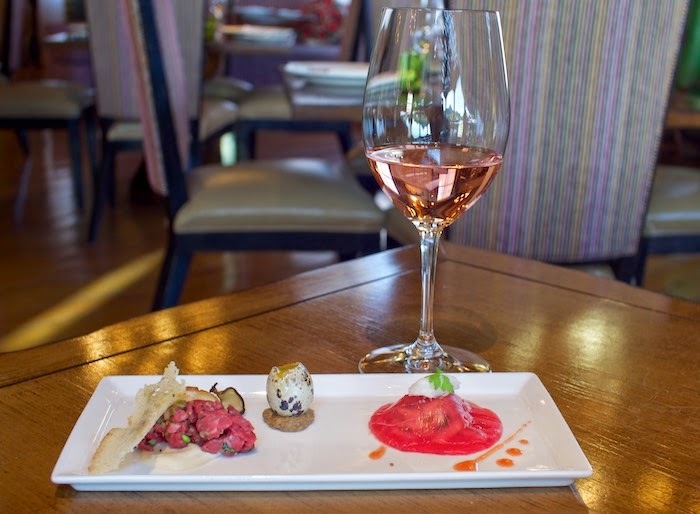 Our next course showcased Chef Gio and his Mediterranean roots. We were served a seared scallop over the most delicious peperonata topped with a pinenut butter. A nice touch was the smear of calabrian chili painted on the plate for those that preferred a little heat. Next, Chef Mel introduced us to olive oil poached Alaskan Halibut. An underused technique, poaching produces a fish that is incredibly tender and full of flavor. 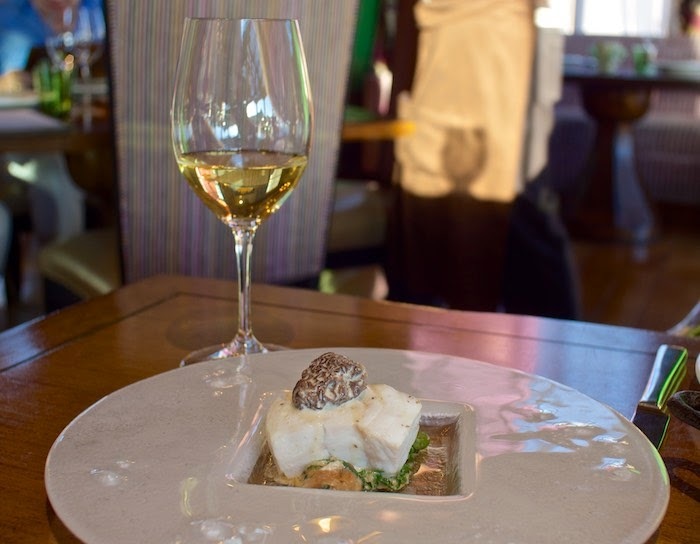 The halibut was served with sweet breads, fava beans and morels and it was paired with a pour of Hirsch Chardonnay. 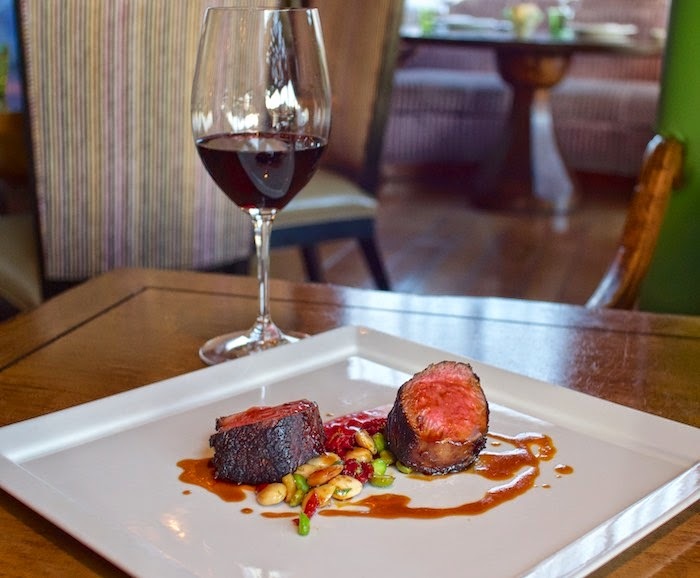 Chef Gio's creation, the Colorado Spring Lamb served with a mixture of fresh ceci beans & marcona almonds, came next. The plate was beautifully dressed with pimenton & sherry sauce. I loved this dish and how perfectly it paired with the il Bruchiato red blend. 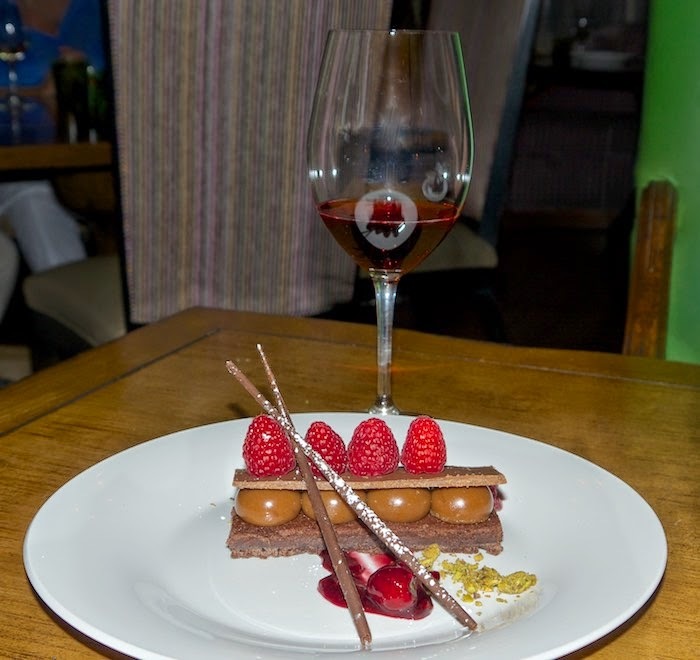 Dessert, prepared by Talavera's pastry chef Lance Whipple, was a Gianduja Cake (chocolate hazelnut) with a layer of praline budino and a hint of raspberry jam. It reminded me of a big bowl of Nutella with raspberries. Needless to say I savored every bite. The schedule for this ongoing series includes: Crush Lounge, May 17; Barrio Café, June 14; Beckett’s Table, July 19; and Crudo, Aug. 23. More chefs/restaurants will be added in the next few weeks so be sure to check back often. This is an event you won't want to miss!! Wow, everything looks mouthwatering! I definitely need those warm poppy seed buns and butter in my life...but then I want the halibut and lamb, too. Those warm poppy seed buns are calling my name! What a delightful feast you had! Too flipping fantastic! I HAVE to get to this restaurant. Only about 1 1/2 hours away. It all looks great but I've especially got my eye on that ahi tuna and crab ravioli! What an elegant and beautifully presented menu! That dessert!! I need it asap! It's beautiful! What a fun concept, I'll bet the chefs (and diners) just love it! What a fun idea for a menu! That lamb looks phenomenal! This is an amazing food spot! I was looking for best venues in NYC for my party and that’s how this post came up. Couple of my friends have been to this place and have told me many great things about this venue.